The Nikon PC-E Micro Nikkor medium-telephoto 85 mm f/2.8D lens is ideal for close-up shooting at up to 1/2x reproduction ratio. This lens is dust- and moisture-resistant for reliable use even in harsh shooting situations. 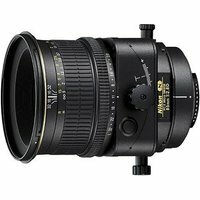 ±8.5° tilt, ±11.5mm shift and 90° axial (rotation) movement is also featured on the Micro Nikkor 85mm f/2.8D lens.